Liza Houston’s creative work has spanned many professional disciplines. She has designed identity systems, publications, and communication campaigns; she has art directed events, conceived scenic design, and produced a line of note cards; and for the last sixteen years, she’s taught high school students to think creatively, see more, and make meaningful art and design. In her studio practice, she works in drawing, painting, and collage. Liza has a BFA from Rhode Island School of Design. 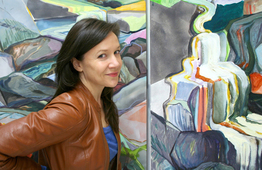 She is the recipient of an artist/educator fellowship from Skidmore College, and has exhibited in galleries in Massachusetts, New York and Rhode Island. Her home and studio are in Stoughton, MA.